Steeped in controversy, the Swiss National Bank unexpectedly made a shocking announcement to the market that it is discontinuing the minimum exchange rate of CHF 1.20 per euro which took the market by surprise causing the Swiss Franc to skyrocket from its current value. A copy of this announcement from the Swiss National Bank is show below which explains it's reasons for doing so. Unfortunately, many speculators, banks, brokers and traders were caught off guard by this large move, so much so that it has pushed some to the point of impending bankrupcy. 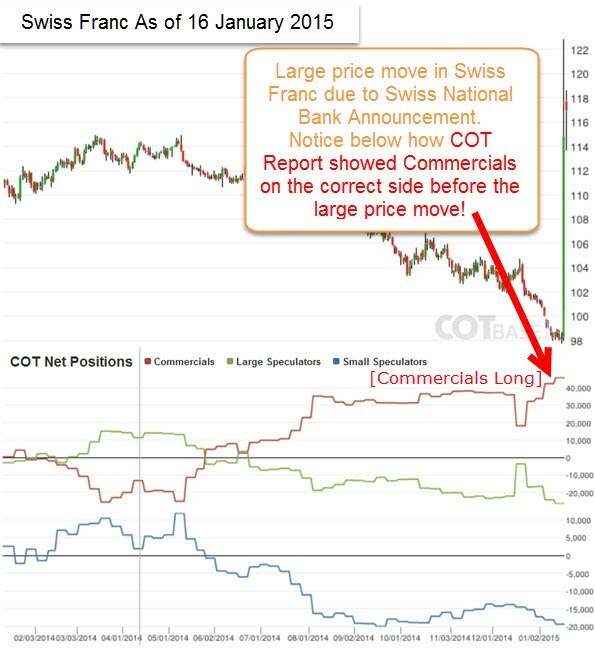 On the COT data report (Commitment of Traders Report) shown below, that the "Commercials" were expecting the Swiss Franc to appreciate in value as they were heavy buyers of the currency prior to the announcement, and also several months earlier too. What can we learn from this incident? Read more below about the upcoming European Central Bank Announcement due on 22 January 2015. The Swiss National Bank (SNB) is discontinuing the minimum exchange rate of CHF 1.20 per euro. At the same time, it is lowering the interest rate on sight deposit account balances that exceed a given exemption threshold by 0.5 percentage points, to −0.75%. It is moving the target range for the three-month Libor further into negative territory, to between –1.25% and −0.25%, from the current range of between −0.75% and 0.25%. The minimum exchange rate was introduced during a period of exceptional overvaluation of the Swiss franc and an extremely high level of uncertainty on the financial markets . This exceptional and temporary measure protected the Swiss economy from serious harm. While the Swiss franc is still high, the overvaluation has decreased as a whole since the introduction of the minimum exchange rate. The economy was able to take advantage of this phase to adjust to the new situation. Recently, divergences between the monetary policies of the major currency areas have increased significantly – a trend that is likely to become even more pronounced. The euro has depreciated considerably against the US dollar and this, in turn, has caused the Swiss franc to weaken against the US dollar. In these circumstances, the SNB concluded that enforcing and maintaining the minimum exchange rate for the Swiss franc against the euro is no longer justified. The SNB is lowering interest rates significantly to ensure that the discontinuation of the minimum exchange rate does not lead to an inappropriate tightening of monetary conditions. The SNB will continue to take account of the exchange rate situation in formulating its monetary policy in future. If necessary, it will therefore remain active in the foreign exchange market to influence monetary conditions. As we saw on the COT chart above for the Swiss Franc, the Commercial Interests data indicated an appreciation in the Swiss Franc was due and that is what happen. Hence, if we draw a similar conclusion with the Euro we notice that Commercial Interests are once again "heavily long" as at 16 January 2015. Not only that but looking at all the major currencies they all seem to be ready for a reversal because the "Commercials" and the "Large Speculators" are at divergent extremes. This is known to be an indication that the markets have a very high probability of changing direction. Free Cot chart are available at www.cotbase.com. Well worth at look to see what the Market Movers are up to. (The Commercials). Learn more about COT data here.